I grew up in a family where both my parents worked full time for most of my childhood. I recall my Mom going back to work as soon as little bro entered kindergarten at age 5 (I was 7, big bro 11, big sis 13). Back then, we ate lots of Kraft Mac and Cheese, Hamburger Helper, Top Ramen, Micky D’s and Kentucky Fried Chicken. It’s tough getting food on the table for 6 people when you get home from work at 6pm every night. Heck, it’s tough for me getting food on the table every night for a family of THREE, and I am able to work from home! …SO… You can easily see what my comfort food items are (alebeit not very healthy comfort food). I have always loved Kentucky Fried Chicken coleslaw. This is my “go-to” recipe when hubby harvests cabbage and carrots from our garden. During harvest time, I make this once a week. It keeps well all week long, and is a great mid-day snack for that 3pm slump. Water chop the cabbage. This method will get you that KFC texture and is far easier than chopping by hand. Cube up the cabbage into 1 inch chunks, fill your blender about 3/4 full with cabbage, and add water to the top. Pulse until you get a nice fine chop in the style of KFC’s coleslaw. Let cabbage drain in a colander while you prep the “sauce”. For the sauce combine sugar, salt, pepper, milk, mayo, buttermilk, vinegar, and lemon juice until smooth. 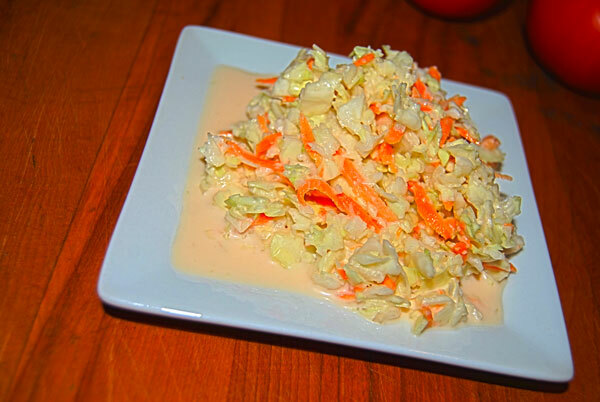 In a large bowl combine cabbage and grated carrots, pour sauce over and mix well. Cover and chill for a couple of hours before serving. I confess that I always loved KFC coleslaw as well. I try not to use dairy anymore, but I am intrigued by the buttermilk. Wondering if I could use almond milk. Hmmmm. Thanks for sharing! That’s a great idea….I have never used almond milk, but have heard it’s sweet, which might allow you to cut back on the sugar.